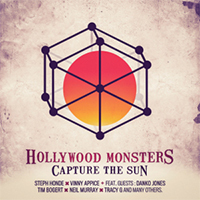 Hollywood monsters return with a follow up to "Big Trouble"... and an all-star shining line up enhanced with names such as Tim Bogert, Tracy G, Neil Murray and Danko Jones, among others. The album shivers as a squalling noise-fest that drifts into solitude o a couple of occasions. It's not a revelation, but it's fun nevertheless (for the most part at least), and the racket this lot makes grants us some interesting moments on the way. "Always Chasing the Same Car" throws up dirty clouds of grating supergroove and lurching riff monster "Evilution" summons a unthwartable punk rock assault. Dreamy "King For A Day", the swampy boogie of "Capture the Sun" and the ramshackle "It's A Lie" serve as notable examples of Hollywood Monsters' abrasive power. However, HM make some questionable moves. As the deep-fried pop rock of "Everything Is Going To Be Alright" gives way to the appropriately titled voyage into mediocrity that is "Another Day in Grey Part II" it is hard to understand the band's decision to temper with sub-par slush. An excruciating cover of "Fool For Your Loving" seems to make things even worse; but luckily for all a more than decent take on Bowie's "Sweet Thing/Candidate" comes running with the antidote. "Evilution" is a decent effort from an all-star lineup, but as a whole it's difficult to shake off the sense of afterthought that could be cluttering up an otherwise strong release.